The initial personel included such great players as George Chisholm, Kenny Baker, Ronnie Aldrich and Tommy McQuater - just to mention 4 musicians who would go on to even greater heights musically after the war finished. The orchestra eventually ended up under the leadership of Jimmy Miller throughout the war years. Of the orchestras' first broadcasts in January 1941, one critic in the Melody Maker was to write 'Any of you lucky enough to hear this airing will, I am sure, agree ....... that this is the greatest dance band performance that has ever been broadcast this side of the Atlantic'. The band was to receive many similar accolades throughout its¹ existence. After the war, the musicians decided to keep the orchestra together as a co-operative. 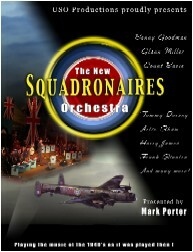 The Squadronaires then remained together under Pianist Ronnie Aldrich until 1964 when, with the advent of the new music, the dance and swing orchestras became unpopular with the masses. Some years later, due to the hard work of Syd Lawrence, the style of Big Band music began to regain popularity. The (new) Squadronaires Orchestra was reformed under the leadership of Saxophonist Harry Bence and worked as a modern style band. Following the death of Harry Bence in 1997 the orchestra came under the leadership of Trumpet player Greg Francis and the orchestra became a part of the United Services Organisation which handles the world famous Memphis Belle Swing Orchestra (from the film Memphis Belle) and the Glenn Miller Tribute Orchestra. Because the USO is concerned with the heritage aspect of its orchestras, it was decided to have the orchestra dressed and presented just how it was in the 1940's. That means the musicians have to be young - no beards , long hair or earrings! Most importantly they are now dressed in authentic RAF uniform. The band desks are motived with the RAF roundel and are in red white and blue, and the stage backdrop is a massive 16 x 8 RAF ensign flag and the Union flag. The main aims of the USO orchestras are to introduce young musicians to the era of Swing, and to teach them to perform just how it was then. If you want pure and professional British nostalgia - (and tunes people know) this is the band for you!